A documentary of the Robert Plant & the Band Of Joy London Concert performance will premiere on HDNet on February 20th at 8:00 PM eastern time. While the official Bonnaroo 2011 lineup release date has not been announced yet, more and more of the lineup is becoming clearer as bands self-confirm. In recent weeks, Gregg Allman, Black Star, Big Boi, and Bruce Hornsby have self-confirmed appearances at Bonnaroo 2011 and now the biggest artist yet has self-confirmed as a Youtube video has surfaced of Robert Plant and the Band of Joy in Washington D.C. last night signing off with a statement "We'll see you soon at Bonnaroo." Robert Plant is, of course, best known as the lead vocalist for pioneering 70's hard rock act Led Zeppelin but in recent years, Plant has been exploring his Americana roots, first on his critically acclaimed album with Alison Krauss Raising Sand and most recently with his new group and album, both called Band of Joy. Robert Plant's Band of Joy is a who's who in Americana music guitarist, consisting of Buddy Miller, vocalist Patty Griffin, bassist Byron House, and multi-instrumentalist Darrell Scott. The album has gotten very positive reviews and has dominated the Americana Music charts since coming out in September.."
Plant is no stranger to the Bonnaroo festival. He was a Sunday pre-headlining act at Bonnaroo 2008 with Alison Krauss, going on just before festival closers Widespread Panic. Plant's set was well-attended and it is assumed that Plant's position on the schedule will be similar to his Bonnaroo 2008 position, performing on the What Stage, Bonnaroo's biggest. E.E. Bradman reviewed the Manson John Paul Jones Signature E-Bass in the February 2011 edition of Premier Guitar magazine magazine quite favorably. Starting off with a brief history of Jones and his career and then dives into the specifications of the bass guitar built by luthier Hugh Manson, such as the Badass II bridge, the mahogany and maple cap body, the EMG pickups and the push-pull selector which activates the bridge single coil. Plugging in the bass guitar, the reviewer still gave high praise to the bass, saying that it offered "thick and warm character - strong and barky in the mids, but not muddy." Despite the $3200 price tag, this signature bass is top notch. It isn't a stock bass with minor adjustments, it is truly an original bass that will do anything you tell it to. The February 2011 edition of Premier Guitar is currently available at all newsstands, or you can read it online. Calling all prog heads and music nerds. Glenn Hughes (Deep Purple, Black Sabbath), Jason Bonham (you know, John Bonham's kid), Joe Bonamassa (that famous blues guitarist) and Derek Sherinian (Planet X, among others) are performing together under the Black Country Communion moniker. They plan to release their second album this June. It'll follow their self-titled debut. A tour is expected to coincide with the releae of the platter, as well. A 5-CD box set called The Yardbirds: Glimpses 1963-68 that has taken five years to compile is promising previously unheard tracks and an in-depth booklet with unseen photos. 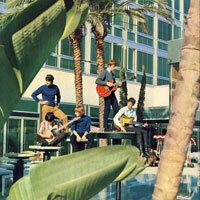 The set, to be released on the Easy Action Records label, is fully licensed by EMI, BBC and the Yardbirds. For Led Zeppelin fans, and specifically Jimmy Page fans, this set offers a fair bit of Jimmy Page material, including Stroll On (the Yardbirds take' on Train Kept a Rollin' for the film Blow-Up), plus early versions of Dazed and Confused and White Summer. White Summer, a Jimmy Page guitar instrumental, later became a live staple for Led Zeppelin. The audio also includes several interview clips from members of the Yardbirds, including three with Jimmy Page. The last disc has live BBC material throughout the Yardbirds' career, including two appearances from the Jimmy Page era, in 1967 and 1968. The first disc also contains some BBC recordings with Page. The box set is currently not available for ordering, and no release date is currently listed for the product.